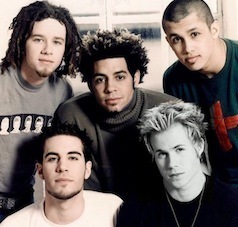 The newly-reunited members of boyband O-TOWN were “really hurt” when ASHLEY PARKER ANGEL refused to sign up for their pop comeback, according to singer ERIK-MICHAEL ESTRADA. The All Or Nothing hitmakers, who formed on the first season of MTV reality show Making The Band in 2000, announced earlier this week (begs17Jan11) they are reforming as a four-piece, without Parker Angel. The star, who has gone on to perform on Broadway and land acting roles in TV and film, called the decision “difficult” but “necessary” to move on with his career. Estrada has now spoken out about the snub, insisting he thought Parker Angel “would want to be a part” of the reunion. He tells TMZ.com, “He said he’s not gonna do it, man. You know, he’s doing his own thing. I guess he can’t multi-task. He wants to be an actor and you know, that’s cool. Just when you were thinking, “Hey, whatever happened to those guys from O-Town? ?” — TMZ has learned 4 out of 5 band members have reunited … and they’ve already begun to record new music! Sources close to the band tell TMZ … Erik-Michael, Dan, Trevor and Jacob are back in the studio … sans one member who just didn’t feel like getting the band back together — Ashley Parker-Angel. We’re told the guys — who were all plucked out of obscurity on the very first “Making the Band” in 2000 — have been kicking around the idea of a reunion for a while … and have spent almost a year trying to get Ashley on board. But a few weeks ago — when it became clear Ashley wasn’t going to change his mind — the guys decided to officially move forward without him … and are now trying to work out some tour dates. They want it all … or nothing at all. Remember the TV reality show “Making the Band,” which spawned the short-lived boy band O-Town? If you weren’t a 12-year-old girl in 2000, when the show premiered, you might not. Even Sean “Diddy” Combs, who joined the show after its first season, couldn’t make it a bona fide hit. Nevertheless, the show’s revenue is at the center of a suit pitting the bankruptcy estate of a film production company once run by Lou Pearlman — the infamous boy band manager who is now serving time in prison for orchestrating a $300 million Ponzi scheme — against Viacom, MTV and the Diddy-controlled companies Bad Boy Films and Bad Boy Records. The Pearlman estate claims that Viacom and the Bad Boy companies cheated it out of at least $60 million generated by the Making the Band franchise. In two brief orders issued Friday (here and here) Orlando federal district court judge John Antoon II ruled the suit can go forward, denying motions to dismiss by Viacom and the Bad Boy companies. Pearlman’s film and production company, Trans Continental, had a joint venture with Viacom’s MTV to share in the profits from “Making the Band.” But according to Pearlman’s amended complaint, MTV began to push Pearlman out when it brought in Sean Combs as a producer after the first season. MTV, according to the complaint, ultimately stopped paying royalties to Pearlman, arguing that “Making the Band II,” “III,” and “IV” were not sequels to “Making the Band.” MTV retracted that argument after the suit was filed, according to the complaint, and now takes the position that “Making the Band” made no money after the first two seasons. James Sammataro of Kasowitz, Benson, Torres & Friedman, lead counsel for the Pearlman estate, expects the case to be ready for trial next year. “We look forward to having the jury decide the extent of the damages caused by Viacom and Bad Boy’s misconduct, as the evidence suggests that both orchestrated acts that stripped Trans Continental of its rights and interests in the television series, Making the Band,” he said. Welcome to O-Town Web, also known as Sharing This Feeling, the only source online for everything and anything on the O-Town boys. We first came online in 2005 and closed our doors in 2007, but now we're back to continue supporting their solo careers and their reunion tour! Here you'll find high quality videos, pictures, daily news, exclusive stuff and much more! Enjoy your stay and come back soon, because we plan to be your #1 stop for your O-Town cravings. O-Town Web is in no way affiliated with the boys of O-Town, BMG, J Records, Blackground or any company related to them or their management. The only purpose of this fansite is free promotion. This site is made by fans for fans to enjoy. No copyright infringement will ever intended.